SUMMARY: Boyhood captures the growing up years of Mason Evans, Jr. and shows us how messy life can be… in a whole new way. 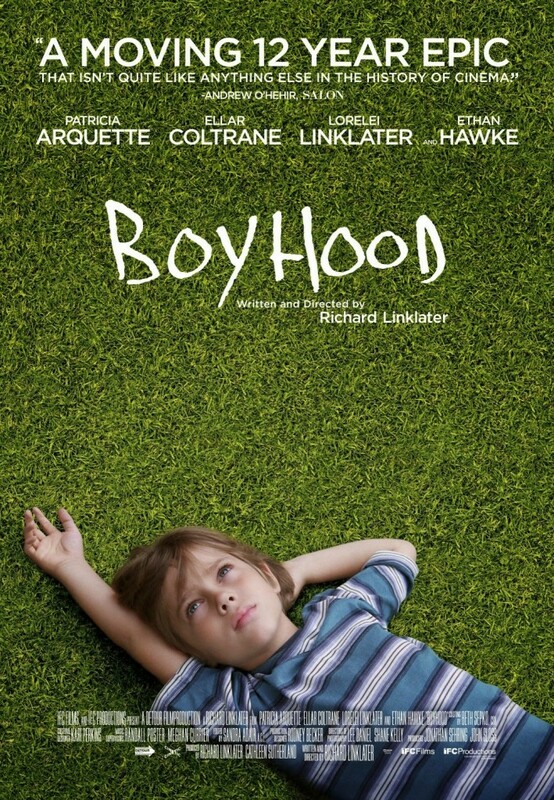 DETAILS: Boyhood is a coming of age story that is told in a whole new manner. One of the beautiful elements of this film is that it was shot over a twelve year period using the same actors throughout, so literally we watch our protagonist age before our very eyes. The film begins when Mason Evans, Jr. (Ellar Coltrane) is six and ends on his first day of college life. In those growing up years we see divorces, remarriages, family moves, the loss of friends and the making of new ones, teenage struggles, and the guts of what blended families can look like. It’s a sad story on many levels as father figures come and go from Mason’s life and yet his real father (Ethan Hawke) is always there for weekend visits, regardless of what disaster is going on in Mason’s homelife. Mason’s mother (Patricia Arquette – Academy Award Winner for Best Actress in a Supporting Role) does her best to better herself along the way through education and trying to marry good men, but the baggage they bring is always a new form of disfunction; drinking, rage, intolerance, control, etc. The film shows the ugly side of divorce, failed marriages, blended families, and broken homes in a powerful way and yet it also shows us that the bloodline that runs from mother and father to son is often the only thing that can hold us together. Nominated for 6 Academy Awards including Best Picture, the film is 2 hours and 45 minutes, but it didn’t feel long. We get to know our characters in ways that traditional motion pictures can only attempt to do through makeup and the artificial aging of characters. Boyhood shows hairstyles, weight gains, weight losses, growth spurts, pimples, and facial hair like no other film has ever done… because it’s what the actors brought with them to the set year after year of production on this epic film. Written and Directed by Richard Linklater, Boyhood is a well done, unique film that is truly one of a kind and worthy of viewing.